What is the customs process in Malaysia to import? How is import cargo released from Malaysia Customs to importer? Who are the parties involved in import customs clearance formalities in Malaysia? Import cargo clearance in Malaysia Customs. 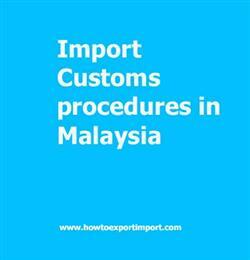 The information provided here details on how to import goods to Malaysia especially import customs clearance procedures in Malaysia. The Royal Malaysian Customs Department, abbreviated RMC or JKDM, is the government agency responsible for administrating the nation’s indirect tax policy, customs border enforcement and narcotic offences. All goods to be imported whether or not subject to import duties must be declared in writing on Customs Form No. 1. Customs duties and taxes must be paid by electronic fund transfer before the Customs Office authorises the export or the import of a good. Malaysia applies at least NPF status to all its trade partners, while granting tariff preferences to the ASEAN countries. Import customs procedures required in TAWAU. Import Customs process in TANJONG MANI. Process to import to SIBU. Requirements of customs to import to SANDAKAN. Customs requirements in PORT KELANG to import. Customs needed to import to PENANG. How can I clear customs to import in PASIR GUDANG. What Customs formalities required to import in MIRI. What should I do to import goods in KUCHING. How to get import customs permission in LABUAN. Procedure to get customs clearance to import in LAHAD DATU. Mandatory process need to complete import in KUANTAN The way to get customs clearance process to import in BINTULU. How to import to India from Niger? How to export from India to Niger? How to export from India to Malta?